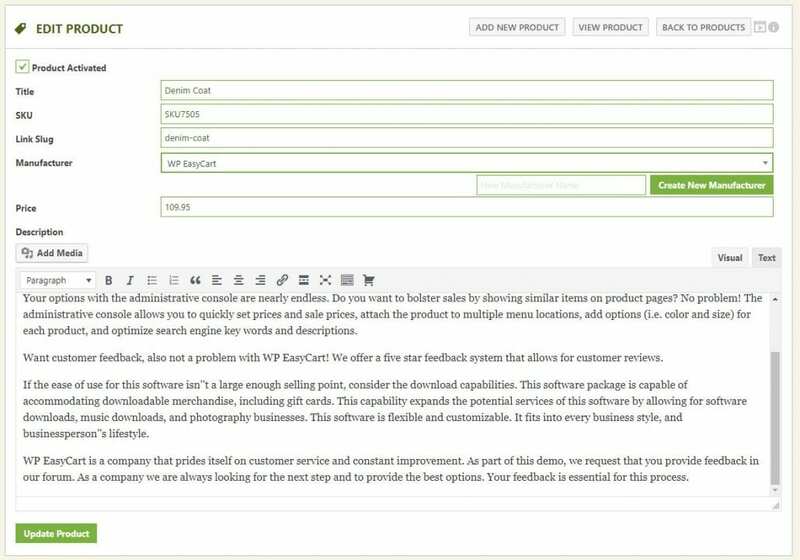 Add a product by navigating to the WP EasyCart => Products panel and click ‘Add New’ in the top right corner. Active or Inactive – Do you want to be able to view this product yet? If not, just activate it later. Title – This is used to create your link slug (e.g. yoursite.com/store/my-new-product) as well as throughout your store. SKU – This is required for linking and tracking inventory. You can enter something random if you have no use for it. Manufacturer – Choose from existing or create a new one by clicking add new. This will slide out a new panel that allows you to quickly create one. Price – This is your base price, you can add volume pricing, b2b pricing, and much more once the base product is created. Image – Start with a single image, you can update later to use up to 5 images or option item images. Options – For FREE users you will see none or basic, licensed users will also see advanced options. The initial creation of a product only allows you to choose existing basic options or create new basic options. Advanced options can be added and created on the next screen. Create and ??? – Do you want to create and edit, create and add another, or just create and close the slide-out panel? 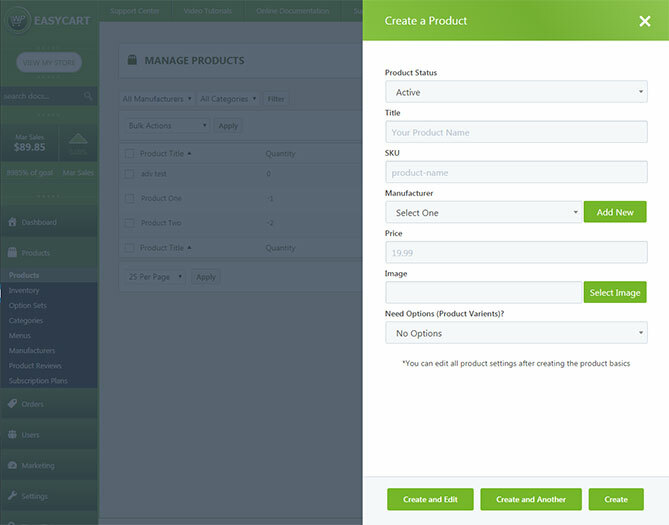 This allows for quick creation of multiple products or just build a product and edit the more advanced options! Once you have saved a product you can begin editing all settings of a product including link slug, advanced options, images, downloads, and so much more. We recommend you do not edit the link slugs or change them frequently as this will adjust your SEO links and could hinder your SEO performance. You may also ‘View Product’ by clicking the top button.